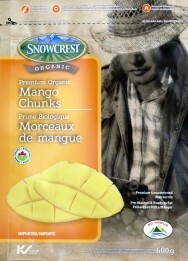 Organic Mango Chunks - 600 g - Snowcrest Foods Ltd. Healthy & Delicious Just Got Easier! 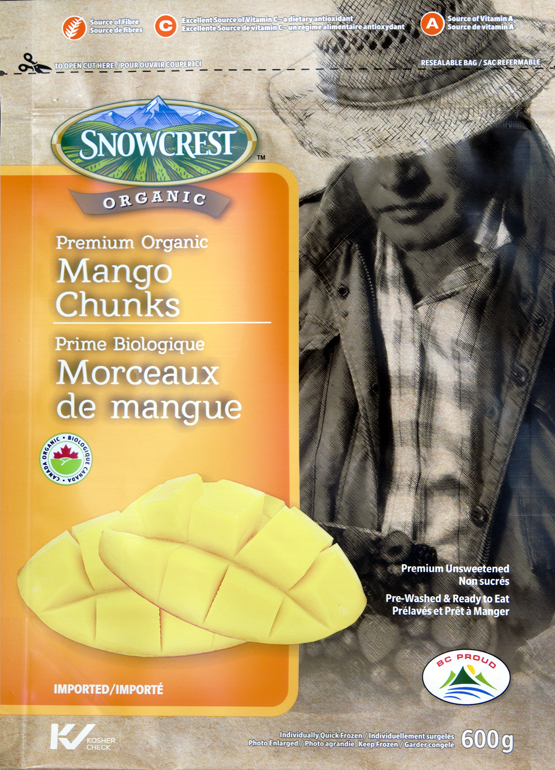 Snowcrest Organic Mangos are fresh, ripe, organic mangos that have been carefully selected, hand cut, washed and individually frozen at the “peak of perfection”™. Our mangos are 100% all natural with no pesticides so these Sweet & Juicy chunks are ready for smoothies, salsa, desserts or any recipe that needs a little tropical sunshine.Use Snowcrest Mango Chunks on cereal, in muffins, pies, crisps, as a flavouring for milkshakes and ice cream sodas, and also in condiments to accompany white meat or fish.Thanks for letting us be a part of your family’s diet. Mango fruit is rich in pre-biotic dietary fibre, vitamins, minerals, and poly-phenolic flavonoid antioxidant compounds. According to new research study, mango fruit has been found to protect against colon, breast, and prostate cancers, and leukemia. Several trial studies suggest that polyphenolic anti-oxidant compounds in mango are known to offer protection against breast and colon cancers. Mango fruit is an excellent source of Vitamin-A and flavonoids like beta-carotene, alpha-carotene, and beta-cryptoxanthin. Together; these compounds are known to have antioxidant properties and are essential for vision. Vitamin A is also required for maintaining healthy mucus membranes and skin. Consumption of natural fruits rich in carotenes is known to protect body from lung and oral cavity cancers. 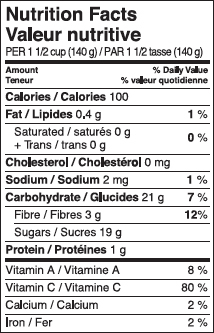 Mango is a very rich source of potassium. Potassium is an important component of cell and body fluids that helps control heart rate and blood pressure. It is also a very good source of vitamin-B6 (pyridoxine), vitamin-C and vitamin-E. Consumption of foods rich in vitamin C helps body develop resistance against infectious agents and scavenge harmful oxygen free radicals. Vitamin-B6 or pyridoxine is required for GABA hormone production in the brain. It also controls homocystiene levels in the blood, which may otherwise be harmful to blood vessels resulting in CAD and stroke.